The third Kearsarge (CV-33) was launched 5 May 1945 by the New York Naval Shipyard, New York; sponsored by Mrs. Aubrey W. Fitch; and commissioned2 March 1946, Captain Francis J. McKenna in command. before departing Hampton Roads 1 June 1948 for duty with the 6 th Fleet. During her tour in the Mediterranean units of the 6th Fleet were placedon alert to insure peace in the Arab-lsraeli area. Kearsarge returned QuonsetPoint, R.I., 2 October and operated along the Atlantic Coast and the Caribbeanuntil 27 January 1950 when she sailed for the West Coast. 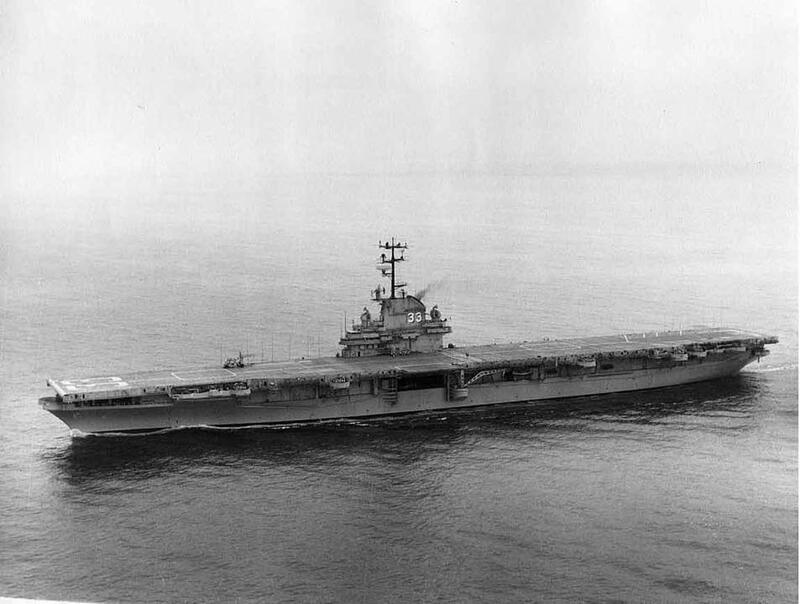 The carrier arrivedPuget Sound Navy Yard 23 February and decommissioned there 16 June 1950for a modernization overhaul that would enable her to handle new jet aircraft. Kearsarge recommissioned 15 February 1952, Captain Louis B. French incommand. Following shakedown the carrier cleared San Diego 11 August forintensive flight training in the Hawaiian Islands. Her readiness complete, she sailed for the Far East to engage in combat missions in the Korean war. Arriving Yokosuka 8 September, Kearsarge Joined the fast carrier Task Force77 off the east coast of Korea 6 days later. For the next 5 months the carrier'splanes flew nearly 6,000 sorties against Communist forces in North Korea, unleashing considerable damage on enemy positions. She completed her tourin late February 1953, returning to her homeport, San Diego 17 March. Whileserving in Korea her classification was changed to CVA 33. Kearsarge sailed again for the Far East 1 July 1953 and operated withthe 7th Fleet fast carrier force during the uneasy truce in Korea. The "MightyKay" also kept watch over the Formosa Straits to prevent the Communistsfrom interfering with the Chinese Nationalists on Taiwan. Kearsarge returnedSan Diego 18 January 1954 to resume training operations off California. Clearing San Diego 7 October, she steamed toward her third deployment tothe Far East. While operating with the 7th Fleet, the carrier stood by to assist the Nationalist Chinese in the evacuation of the Tachen Islands. From 6 to 13 February 1955 Kearsarge supported units of the fleet in the successful evacuation of 18,000 civilians and 20,000 military personnelfrom the islands. Her cruise ended at San Diego 12 May and for the next3 years operated on the annual deployment schedule to the Far East and trainingoperations off California. During the summer of 1958 Kearsarge was fitted out as an antisubmarinewarfare support carrier and reclassified CVS-33. Following intensive trainingin her new role the carrier sailed 5 September 1959 for 7th fleet operationsin the Far East. Early in her tour Japan was hit with a violent typhoon, and Kearsarge played an important role in providing relief to the victims. Her planes landed parties of medical and supply units, while her crew andair group donated clothing and money to the distressed people. After participating in SEATO exercises and 7th Fleet operations, she cleared Yokosuka 3 March1960 for her homeward voyage. Three days later in stormy waters 1,200 miles off Wake Island, four Russians were rescued after drifting 49 days in disabledlanding craft. They were flown back to their country after Kearsarge arrivedAlameda, Calif., 15 March; and the carrier received thanks from the SovietUnion for this gesture. A Year of training operations preceded her next deployment from San Diegowhich began 3 March 1901. The antisubmarine carrier steamed to Southeast Asian waters as the Communists intensified their effort to overthrow thegovernment in Laos. The power and determination of the 7th Fleet was observedby the enemy and the crisis eased. Peace prevailed. After 6 months in theFar East, Kearsarge arrived Puget Sound 1 November for the second phaseof her modernization. Upon completion of repairs and training Kearsarge departed Long Beach1 August 1962 to station herself in the Pacific missile range as a recoveryship in the Mercury orbital space flight of astronaut Walter Schirra. OnOctober after a flawless flight, the carrier played her role in the "SpaceAge" by retrieving Schirra and his capsule and returning him to Honolulufor flight back to the States. Kearsarge resumed training exercises, continuing these for 6 months beforearriving Pearl Harbor 29 April 1963 to once again take part in the spaceprogram. The carrier repeated her earlier recovery by plucking astronautGordon Cooper on 18 May 1963 after he orbited the earth 22 times in hiscapsule "faith 7." She returned the space hero to Pearl Harbor, then departed 4 June on her eighth cruise to the Far East. Operations withthe 7th Fleet included keeping watch on the unsettled problems in Southeast Asia. Kearsarge returned Long Beach 3 December, for training exercises off California. Six months later, 19 June 1964 the antisubmarine carrier was deployedon her ninth Far Eastern cruise. Arriving Yokosuka 30 July, Kearsarge was dispatched to the South China Sea, following the North Vietnamese patrolboat attack on U. S. destroyers in the Gulf of Tonkin. While U. S. Navy planes destroyed North Vietnam oil and supply depots, Kearsarge provided antisubmarine protection for the 7th Fleet. The decisiveness of American action persuadedthe Communists to delay their objectives for the time being; and Kearsarge returned Long Beach 16 December. After overhaul during the first half of 1965, Kearsarge operated offthe West Coast until sailing for the Far East 9 June 1966. Steaming via Hawaii and Japan, she reached "Yankee Station" 8 August and operatedoff Vietnam through 24 October. The next day she headed for the Kuala Lumpurarea and anchored in the Strait of Malacca on the 30th. She returned via Subic Bay to "Yankee Station" 5 November and operated there through the 23d. The next day the carrier started home via Hong Kong and Japan, arriving San Diego 20 December. She operated on the West Coast until departingSan Diego 18 August and reached Pearl Harbor 10 days later to prepare forfuture action.